You can read the first post in the series from myself here and Kwende follow up in a previous post here. A brief note about the term cultural practitioners rather than cultural worker. I am quite fond of this term as it hints more at the challenges in bringing theory into reality. It is a challenging space, sitting at arms length from governments and funding bodies, and facilitating connections between artists and the public (or publics). It is a complex occupation demanding comfort with constant flux. More than work it is a practice that involves great passion. I don’t want to romanticise the cultural practitioner too much, but just to note how I see this term in context before returning to some the ideas in Kwende’s previous post. One of the most obvious items to focus on (in the translation of theory into action) is the city of Ottawa’s renewed Arts and Heritage plan. This is a very solid policy document. It highlights key areas of development needed here in Ottawa, and its success at bringing the document through the political system for acceptance is great to see. As any document of its nature should, it starts from the assumption that arts and heritage are integral to the life of this city. The introduction goes so far as to “celebrate the wisdom that everything depends on creativity”, and while this may be true, the logical extension that arts and heritage are indispensable to the people is tenable. We fight for government funding and we fight for revenue, and often even audience, so while much might depend on creativity, few actually depend on cultural organizations and the artists they present. The policy document is designed to be integrated into the government planning of Ottawa’s growth, and fits this role, but as cultural practitioners I think we need to ask more in-depth questions of ourselves. We cannot assume that culture is valuable for culture’s sake. We need to consider how we make the work of artists indispensible to the people. The problem here is that a cultural ecosystem is difficult to understand, let alone influence directly. The cultural life of a city is not a machine with parts that can be tended to easily. Ottawa, like any city, is a unique ecosystem with complex factors influencing growth, development, demise and decay. These are much more elaborate than can be outlined in any plan, let alone be easily managed. The most obvious example I can think of for Ottawa is A Tribe Called Red (ATCR) and their Electric Pow Wow (EPW) parties. ATCR is significant force of music to emerge from the city, with their debut album longlisted for the critic-driven Polaris Prize this year, and their EPW event transported around the continent. The cultural ecosystem of Ottawa-Gatineau seemed particularly suited to the development of the inherent talent of ATCR. 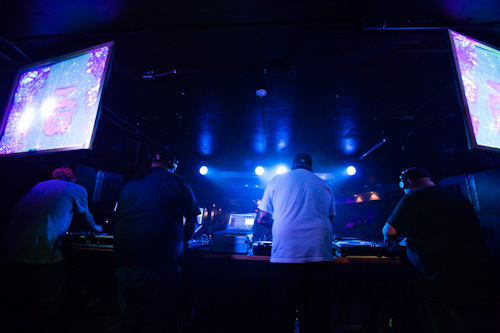 A growing local urban aboriginal population, mixed with how Canada’s political capital could bring people from across the country to their parties, created a receptive audience refreshed to see an aboriginally-driven dance party. Band Chiefs, students, hipsters and civil servants all mixed on the same jumpin dance floor. Not only has ATCR become an exciting musical export of the region, the EPW has contributed something significant to its cultural landscape that is distinctly of this place. To state the obvious, you cannot plan the growth of a group like ATCR. Cultural planning can help create the conditions for a group like ATCR to develop, but it is not a driver. They are not a case study for cultural practitioners either, as their connection to their public was driven by their own passion. As cultural practitioners, this is the kind of artistic endeavour that we need to be on the look-out for (or better yet play a hand in producing). Something that is both good and good for you, and figure out how our resources can add or expand on their work, connect it to different publics or just learn about new approaches to cultural production. As I said before, I understand that reality is messy and full of compromise, so it is a challenge for cultural organizations that every artist and project presented contribute excellence to both its respective discipline and the quality of civic life. This is another reason I think the term cultural practitioner is interesting. Moving towards a space that connects artistic quality and civic engagement requires constant mindfulness as one navigates financial constraints, audience acceptance, media criticism, and more, all challenging you to take your eyes off the prize. This returns me to the question I asked at the start of the post, how do we move from theory to action? From my perspective there isn’t anything we can write to provide precise direction. It is a constant and evolving process, with our cultural organizations in a unique space to experiment with trailblazing between these two islands. Outside of government and industry, supported by volunteerism, cultural practitioners can connect artist and public in a way that makes both richer, but they need to be driven by a broader ideal than the inherent value of art; one that considers its social and political dimensions as well. This is the productive space of the cultural practitioner: socially, politically and culturally engaged in a dynamic narrative that both reflects on the city’s character while challenging its idea of itself. Maybe on this note I can open up the discussion for reader contributions. I would love to hear examples of artists, projects and organizations that truly help shape the place of Ottawa. I am thinking of those things which, in some small way, help redefine how we see the place we live. We have a week to pass the time as Kwende considers my meandering considerations, so I hope to hear some interesting feedback. In case you didn’t go back to Kwende’s post you can get the Ottawa Arts and Heritage Plan here. or better yet listen here. Also see/hear ATCR and Artengine collaboration for Electric Fields 2011 here. A special mention for the link posted in the comments of a previous entry. Luc Lalande, an Artengine Board member, posted this link to a fantastic research paper on a neighbourhood or community adaptation of the creative economy model. This entry was posted on Tuesday, August 14th, 2012 at 11:39 am	and is filed under Ryan Stec, Artistic Director. You can follow any responses to this entry through the RSS 2.0 feed. You can leave a response, or trackback from your own site. A very thoughtful and important discussion so far, with many offshoots to explore further. Plans and policies rarely breed passion. What they can do is fertilize the soil, create favourable conditions for growth. But ultimately, the most vital expressions in the city originate from a sense of urgency from the makers: Kitchen Party, TimeKode, House of Paint, Arboretum, Petite Mort Gallery are all driven by the conviction that this needs to happen. It’s the “exceptions, exclusions, incongruities and contradictions” that provide character to a city. Hi Ryan, thank you for introducing the role of the “cultural practitioner” to this debate. It is a role that I myself can identify with. From the perspective of the “system” of local cultural organizations, I am definitely an “outsider” in that I am not directly employed in this sector nor am I professional artist or other “occupation” considered to be core to the arts/culture sector in our community. I believe that the idea of cultural practitioner is a compelling one. It opens up the potential for those “outside of the system” to participate in the very things you describe in your post about civic engagement and the the value of the arts. In my case, the opportunity to support the Pecha Kucha Ottawa events is a tangible expression of what a cultural practitioner can do. It is not something that comes out of planning documents or committees from within the system but rather it is borne out by individual passion to make a difference. It’s messy as you say, but I do believe that the (unexpected) cultural practitioners do play a vital role in connecting arts and community outside of the “system”. Producing, creating, collaborating, making stuff happens. It’s the ONLY WAY to affect change. If Ottawa is not a creative city, it’s only because there are not enough people being creative. Personally I think there are a lot more people being creative now than there was 10 years ago when I moved here, but if you could measure artistic/cultural action per day per capita, I bet we’d still be on the low end of the scale versus other cities. The only way to make any place more of a cultural place is for the people concerned with culture to work like crazy and produce eye-popping content. When governing and administering continues to be the occupation/predilection of a huge number of people in Ottawa … the challenge is considerable!